← Antarctica’s sea ice sets all-time record for second day in row – how high can it go? As some have jested in the climate blogosphere, UNISYS’ recent SST anomaly map looked like the onset of an ice age. UNISYS has pulled the product down for the time being, citing data processing issues. Many around the climate blogosphere have noted that UNISYS’ recent sea surface temperature anomalies were showing radically different values from various NOAA products. I decided to reach out to UNISYS directly to find out what might be behind the discrepancies, mentioning that it was confusing that UNISYS was showing Hudson Bay cold, water off the East Coast of Russia frigid, and most of the Northern Hemisphere dramatically cooler than 6 weeks ago, when NOAA was showing nothing of the kind. After further thought and additional analysis, I’ve asked that the images be taken down temporarily. 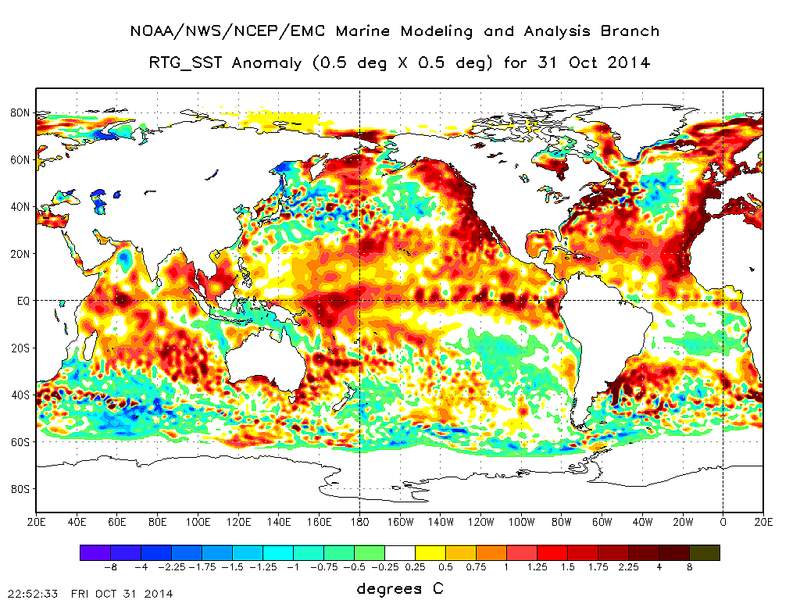 NOAA SST anomaly map for October 31, 2014. The values represented on the map are accurate. What originally appeared to be a simple color bar/enhancement table issue looks to be an issue with our anomaly product itself. I took more looks at areas where our product is indicating cooler than normal, the corresponding NOAA product appears to show warmer. That tells me something is off with our processing. In July, we had to switch to the higher resolution RTG-SST product as the input because we had been using a legacy SST product from NOAAPort that NWS discontinued in June. The SST anomaly product may be suffering from amplified cooling as we transition into NH winter, an error not originally seen when we first switched in the summer. The dataset used to process and create the anomaly appears to also be an issue, perhaps our software is not calculating the correct temp since the switch to the RTG-SST hires. We are going to evaluate this and work on a solution. This entry was posted in global cooling, NOAA, sea surface temperature and tagged noaa, sea surface temperature, unisys. Bookmark the permalink. They’re going to upjust it? No. We are going to take a look at the software, the processing and the input data to try and find out why/when our maps were showing the “cold bloom”. We would never introduce artificial or manipulated data to this product. So NOAA has been lying again? 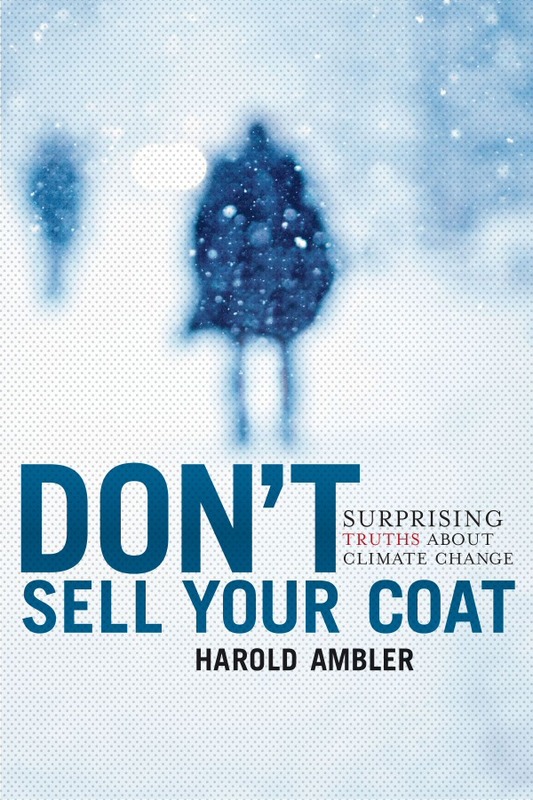 Thanks for looking into this, Harold. One does wonder if the same haste would have been shown if the SST had been showing warmer than normal. I’ll check in periodically to see how this is resolved. I appreciate Harold reaching out to us! We’ve had issues with this product before. Several years ago, we introduced a new color scheme that tended to show the positive anomalies in a very bright and bold set of contours, and we were getting accused of manually inflating the positive temps to promote an “agenda”. Unfortunately, the Unisys scientist that first set up these images moved on from the company a few years back. We’ve been mostly maintaining the site with very few changes except for corporate mandated layout changes (and the change from RUC to RAP model). We’ve reached out to him for help on the SST anomaly images. I made the decision to just pull them down until we can figure this out. I appreciate the notes of support and the awareness from the community to point out this issue to us. Brian, I wanted to thank you for pulling those maps. For the last 2 weeks, it seemed like I was being asked about them daily. And with the overhaul of the NOAA NOMADS website, I no longer have access to their weekly Reynolds OI.v2 SST data. So I couldn’t put an end to the comments by presenting data.